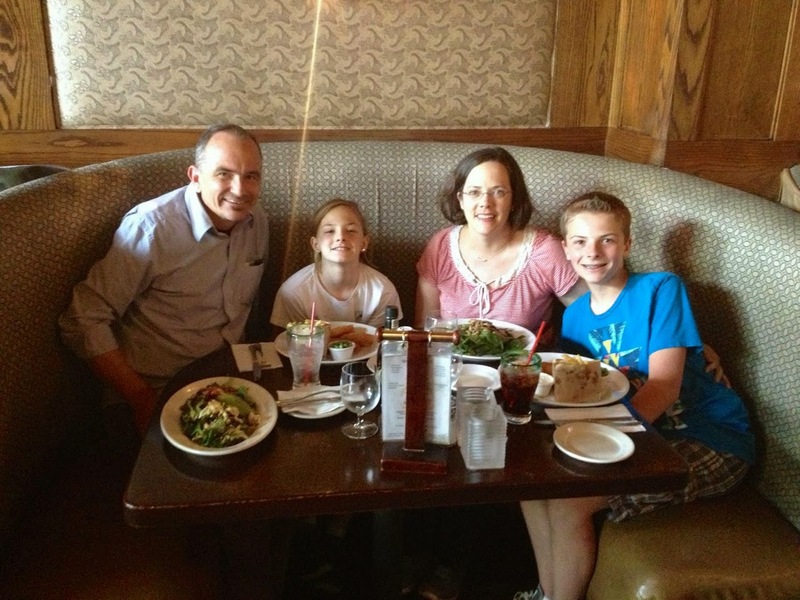 In March 2013 my wife kids and I were back in Los Angeles for a little three day vacation. We started with a quick stop at the Brady Bunch House, then over to the Los Angeles Zoo, and then up to the Hollywood Sign. 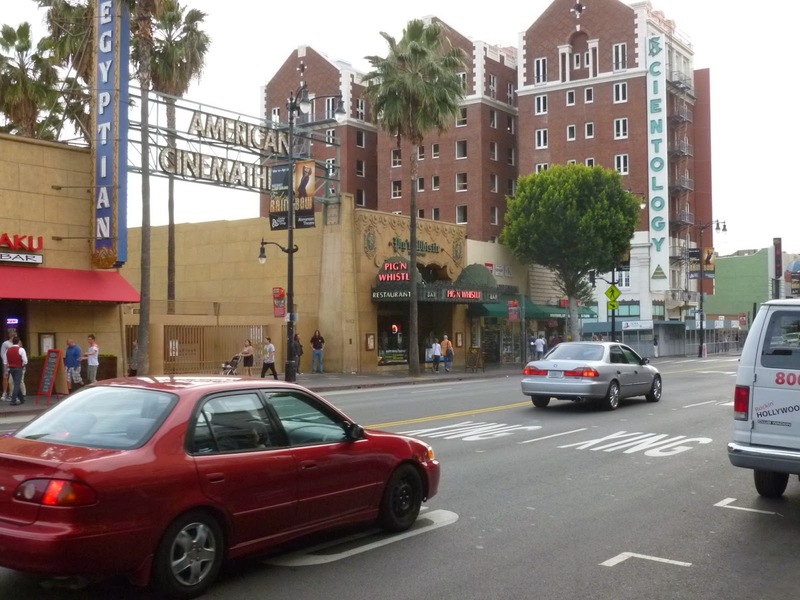 After that, we drove over and checked into our hotel on Sunset Blvd. 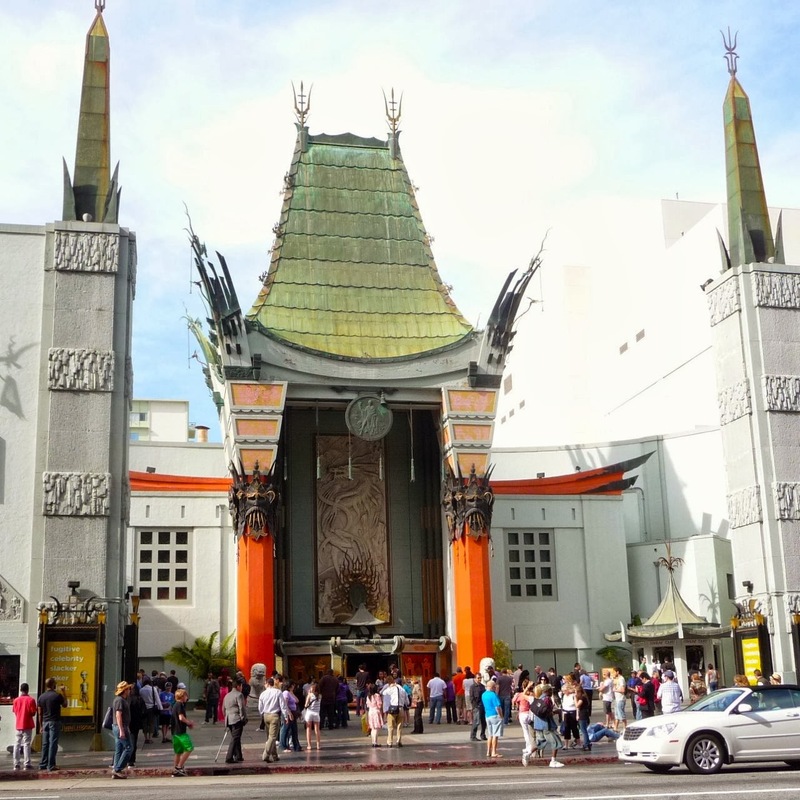 Hollywood Blvd is only three blocks from where we were staying, so it was just easier to walk over and see the sites - including the Chinese Theater, pictured above. 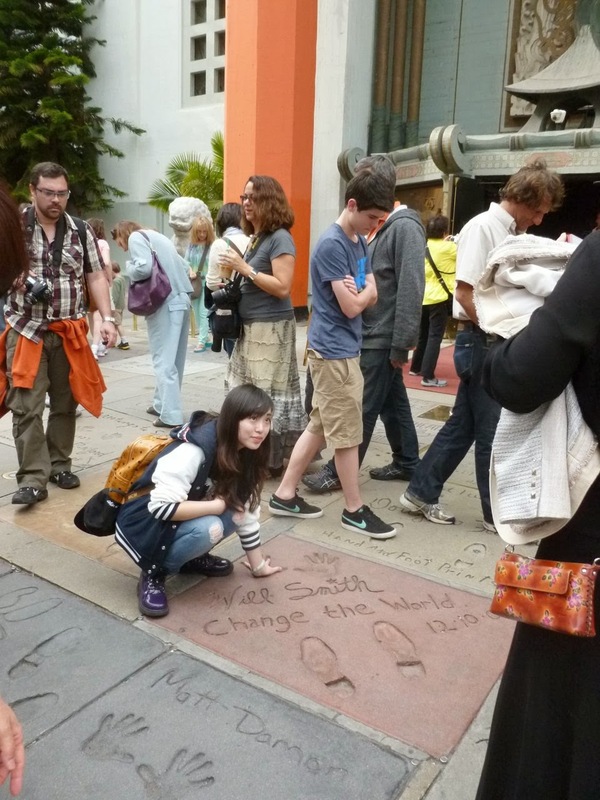 Grauman's Chinese Theater (Graumn's was it's original name, last year it became the "TCL Chinese Theater"). It's arguably the most famous movie theater in the world. 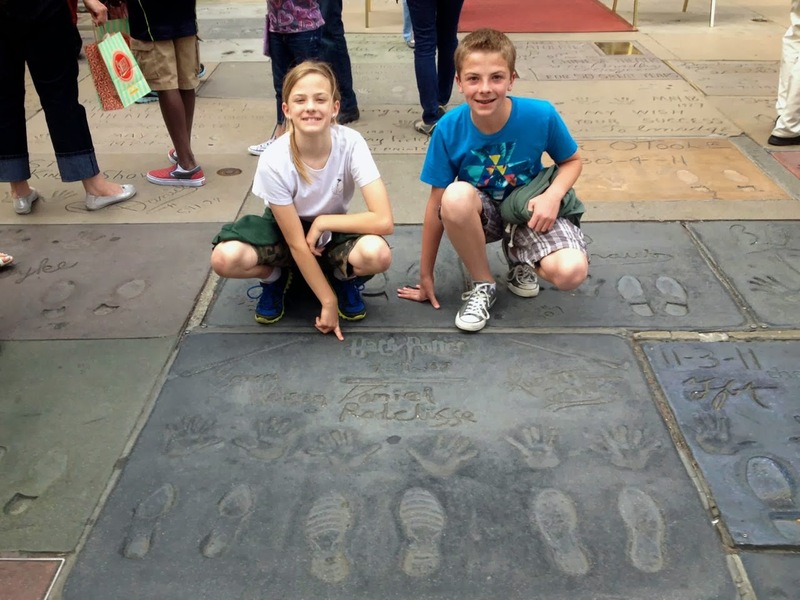 Above, my kids at the footprints from the stars of the Harry Potter series. Tourists from all around the world were there. Above a visitor at Will Smith's and Matt Damon's footprints/handprints. My wife and I were here in 2011 sans kids. 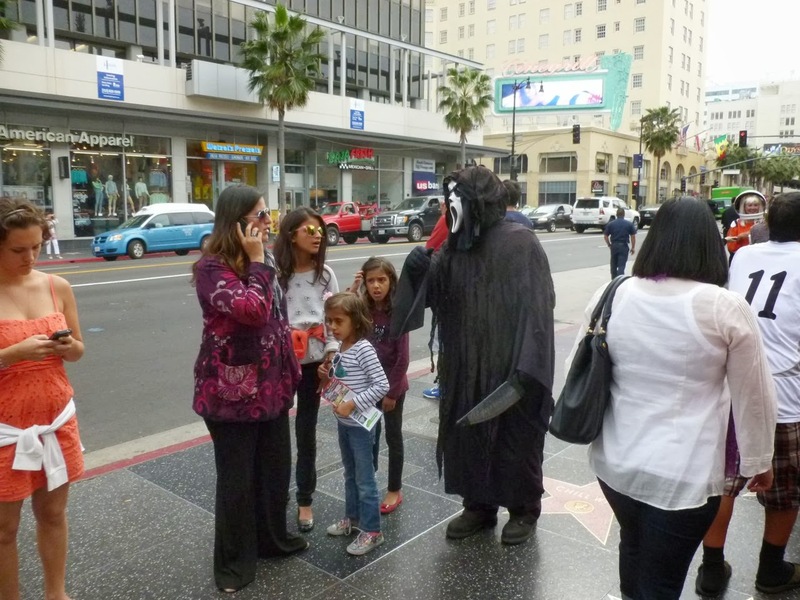 Here's a link to a previous post with more photos and backstory on the Chinese Theater. The original Star Wars premiered at the Chinese Theater back in 1977. I remembering seeing it just a few miles away at the Plitt Theater in Century City. 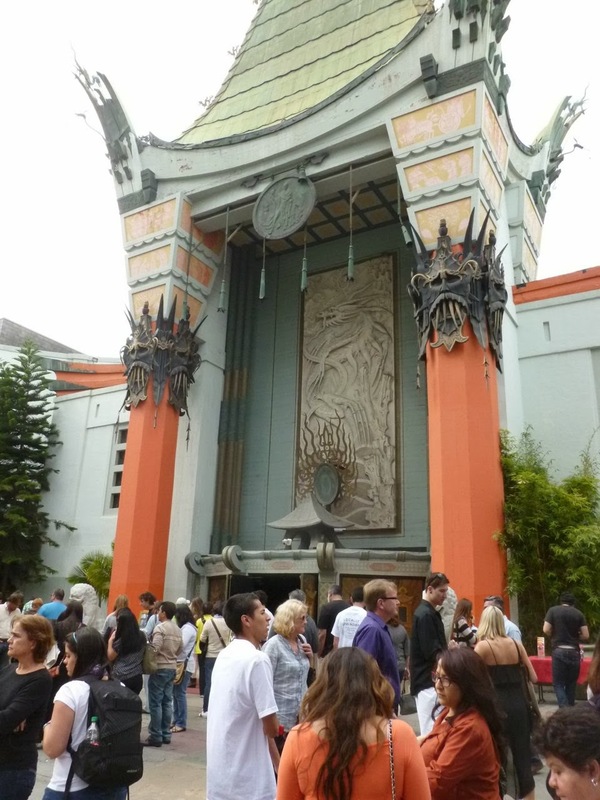 Grauman's Chinese opened in 1927, with the premier of Cecil B. DeMille's film The King of Kings. 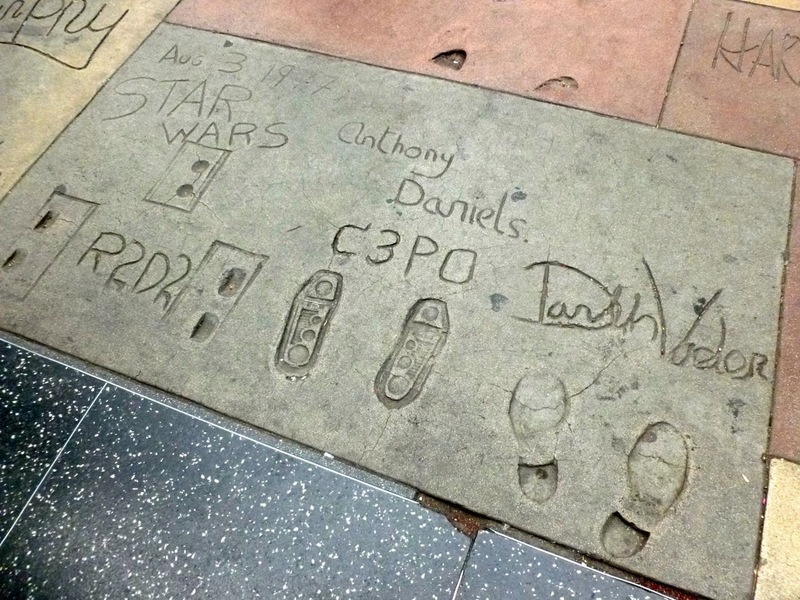 The forecourt features over 100 movies stars footprints and handprints. And there's no charge to walk around and look. Nice. 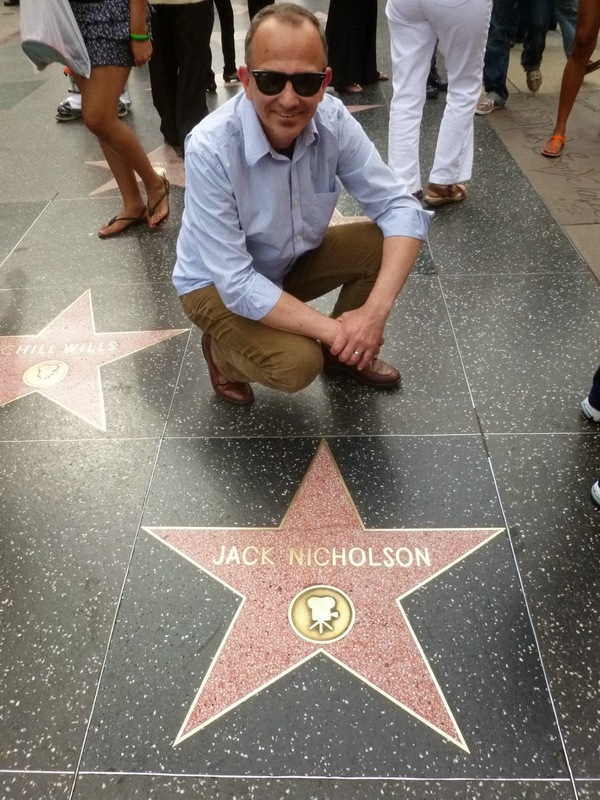 Immediately outside of the forecourt is the Hollywood Walk of Fame. 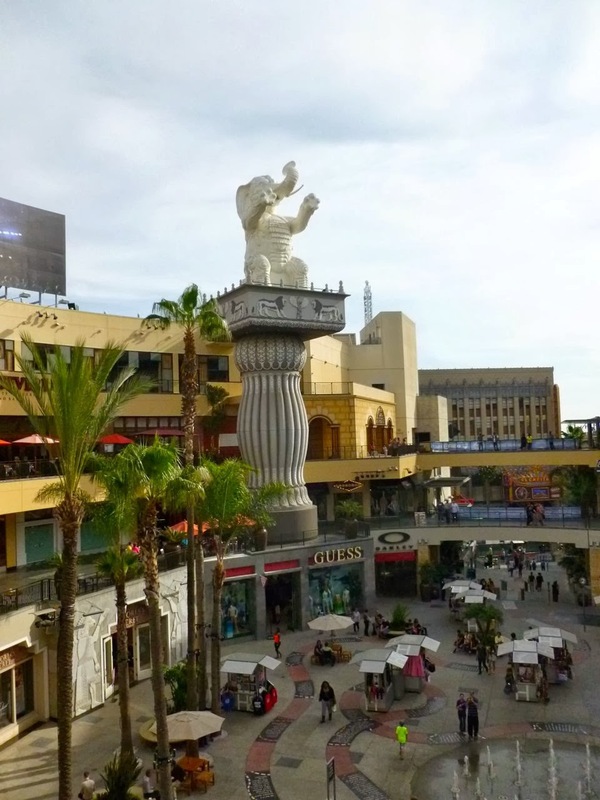 Just down the street from the Chinese Theater is the Hollywood & Highland entertainment complex. Designed to invoke the set of the 1916 film Intolerance, it has the usual suspects you'll find in most upscale shopping centers. Obligatory fountains in the center court. 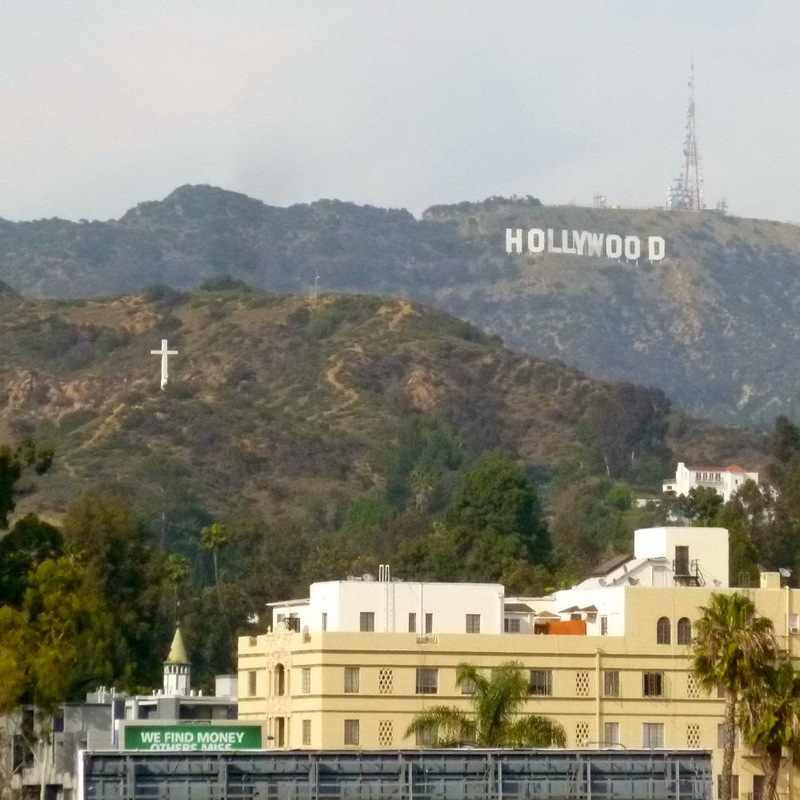 Hollywood & Highland has a great view of the Hollywood Sign - and the Hollywood Cross. To get this view, skip the crowded catwalk in the middle of the complex. 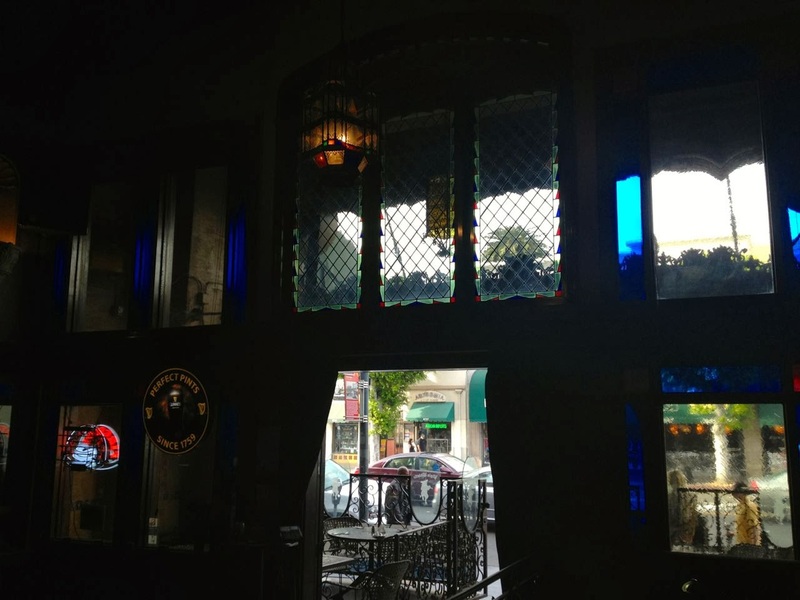 Go up to the top floor, and walk over to the east side (overlooking Highland Avenue). There's an awesome open air patio that nobody knows about - great place to take pictures. Here's a link to my previous post with a few more photos and info. Back out on the street you'll find numerous individuals dresses up in costumes or like Hollywood celebrities, available to take photos with tourists - for a tip. 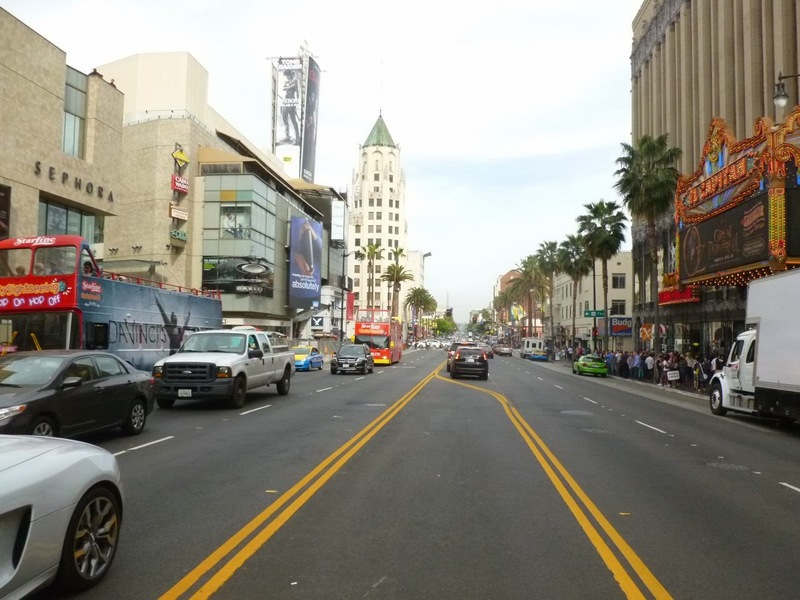 Walking across Hollywood Blvd, looking east. 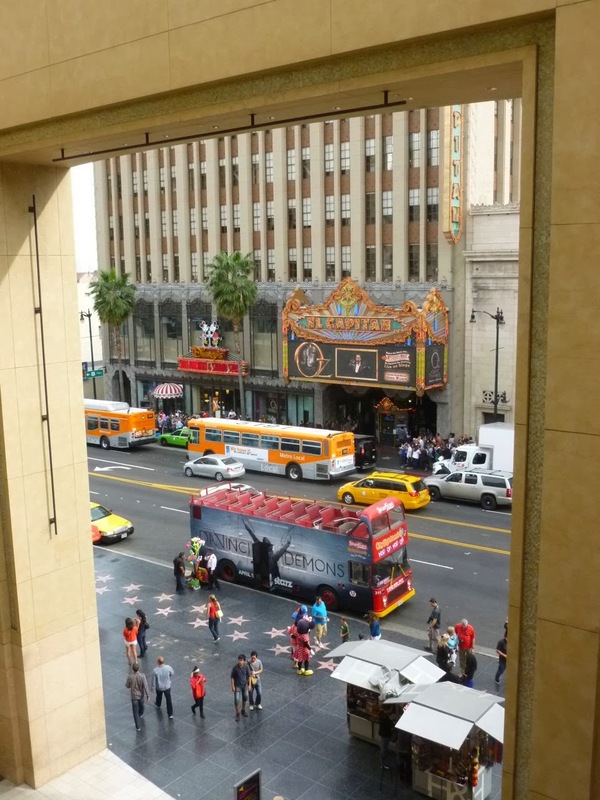 To the left is the Hollywood and Highland complex, and the Kodak Theater - home of the Academy Awards ceremony. Out of view on the left over my shoulder is the Chinese Theater. 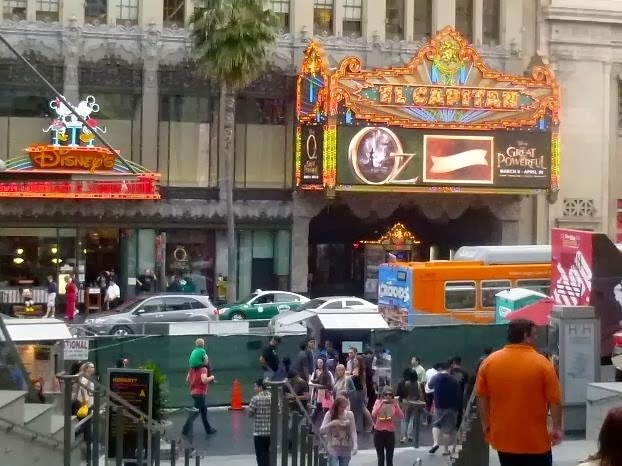 On the right, the El Capitan Theater. More on the El Cap in a moment. We walked east along Hollywood Blvd a few blocks for dinner. I like some of the historical architecture. 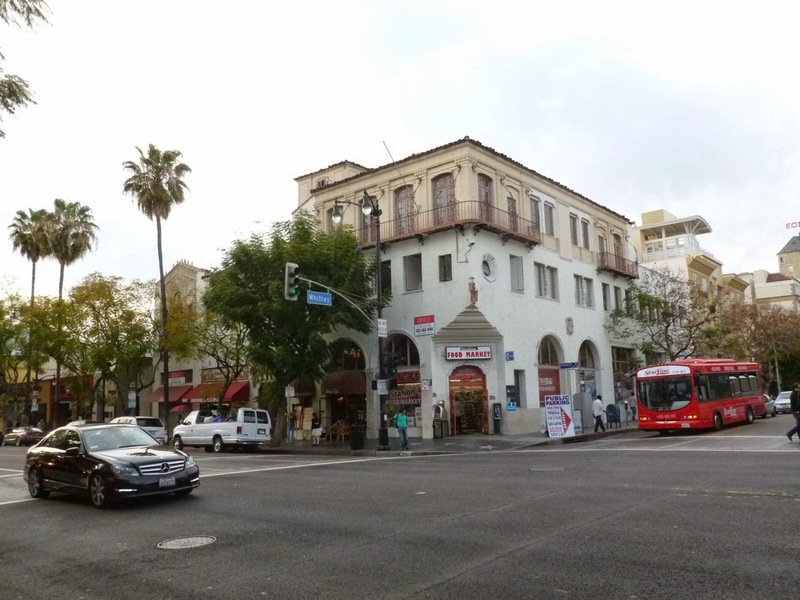 Immediately adjacent to the 1922 Egyptian Theatre, now the home of American Cinematheque, is the Pig 'N Whistle restaurant. 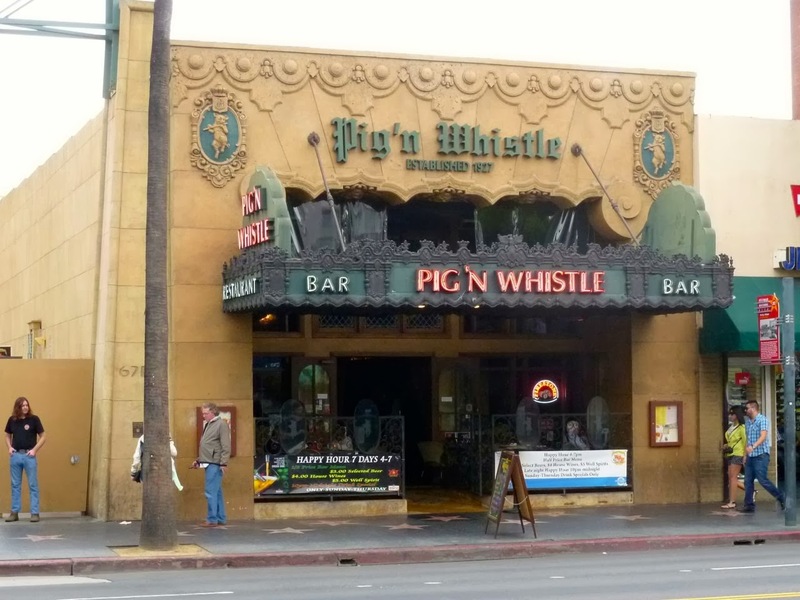 The Pig 'N Whistle opened in 1927, undergoing a major restoration in 1999. They have a family friendly menu, and reasonable prices. It's a great place for dinner if you're in Hollywood. We were there early - my understanding is that it has more of an adult crowd later on. 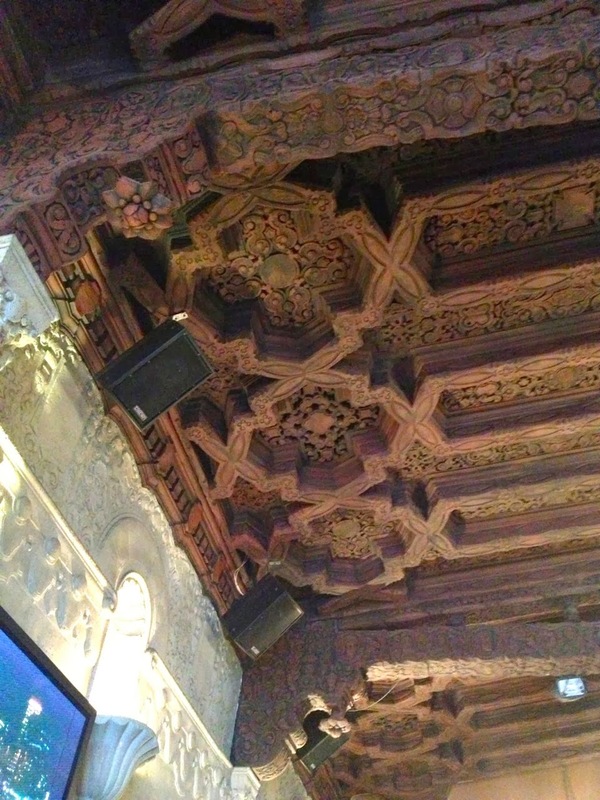 Amazing architecture - this is the ceiling. And looking out towards the street from our table. 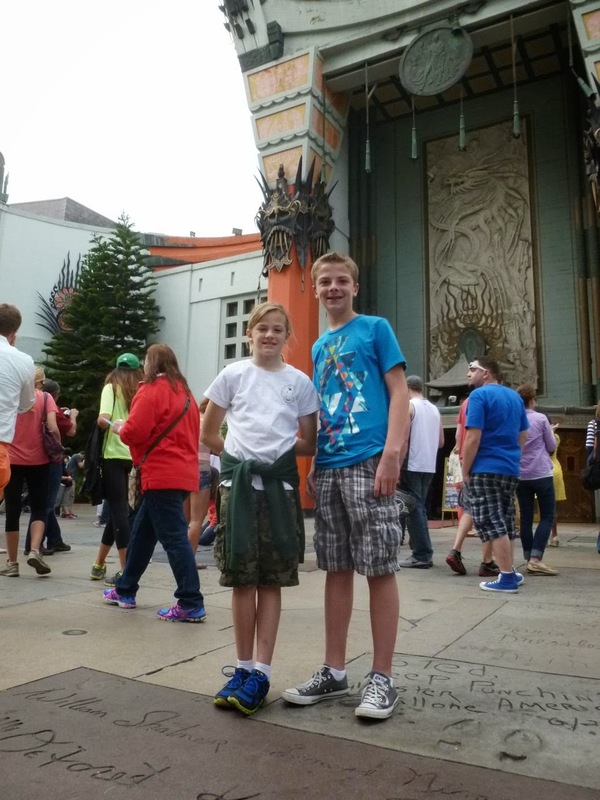 After dinner we headed back to the El Capitan to see "Oz, the Great and Powerful." The El Capitan Theater opened in 1926, and after a $14 million renovation in 1991, became the flagship theater for the Walt Disney Company. We sprang for the extra $$ to see "Oz, the Great and Powerful" in 3D. Above, parents and kids waiting in line for the show. 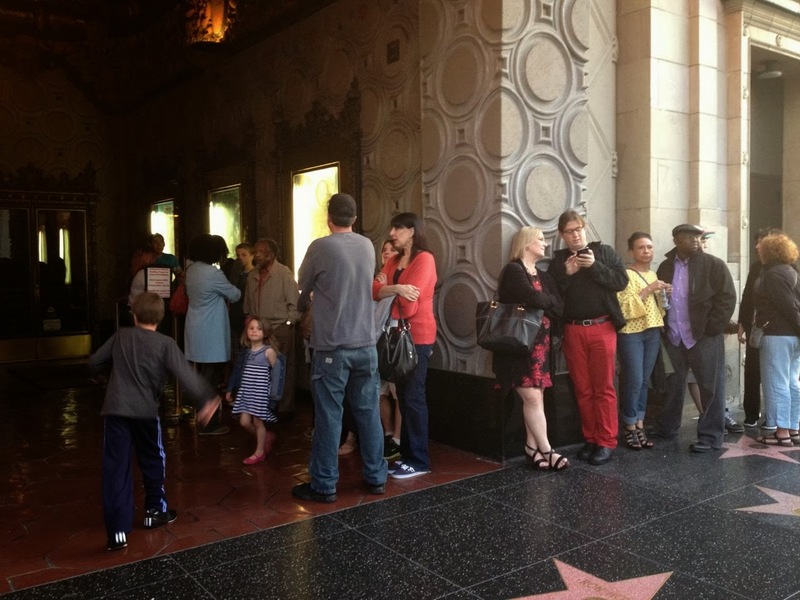 A huge plus of seeing a film at the El Capitan is the special extras. 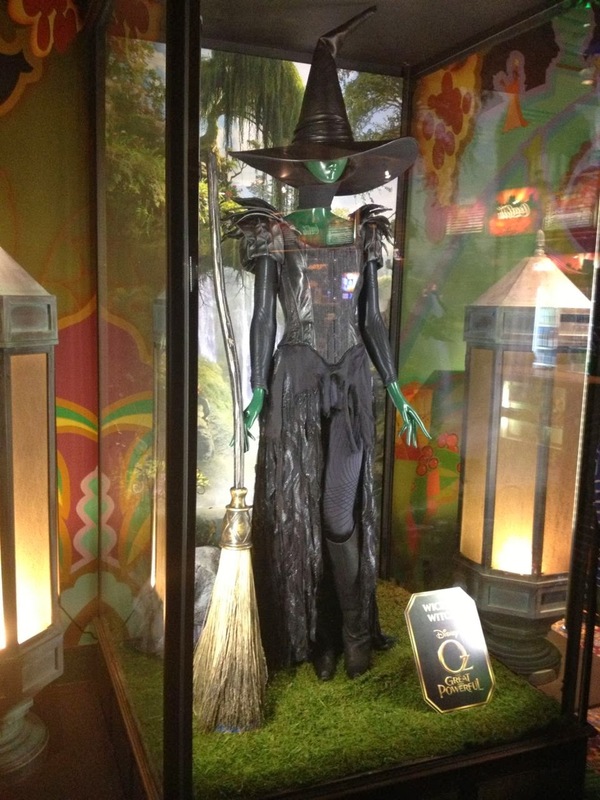 Afterwards, we hung around to look at some of the costumes from the film. 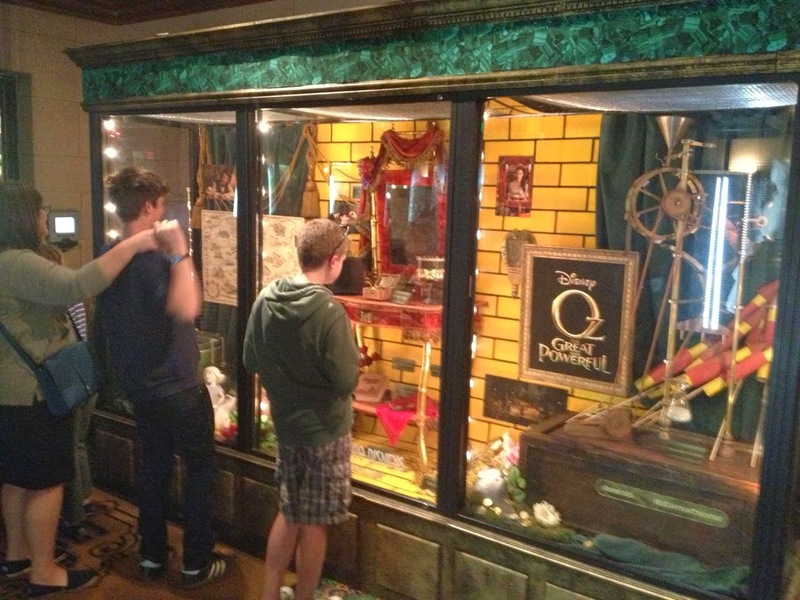 My son looking at some of the props. 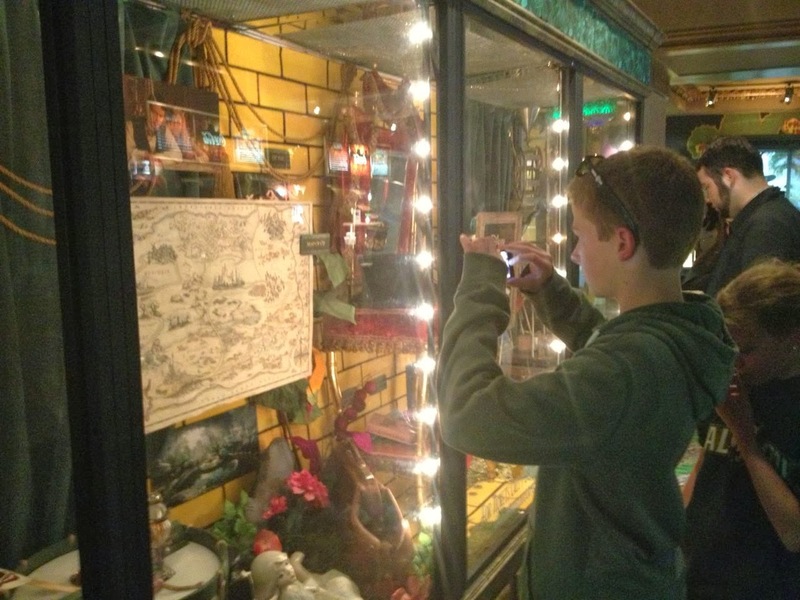 And me taking a picture of him taking a picture. 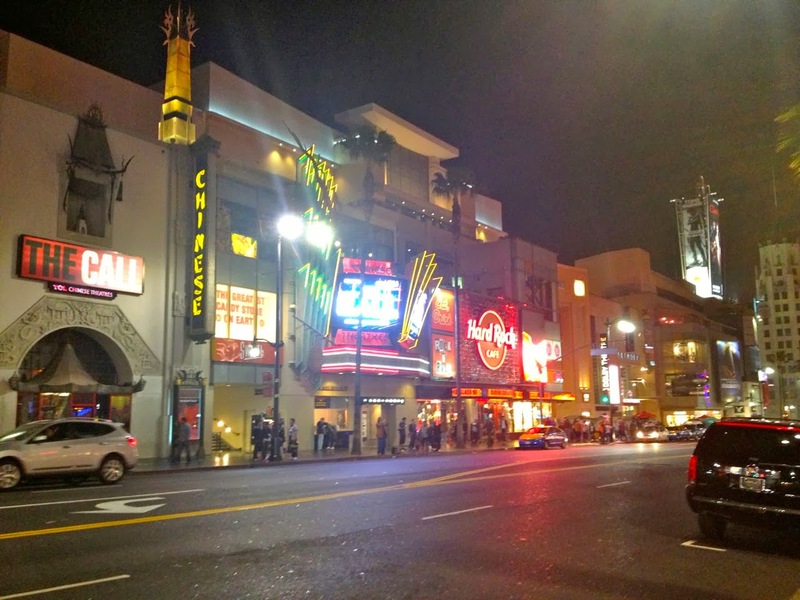 Outside the theater: Hollywood Blvd at night. 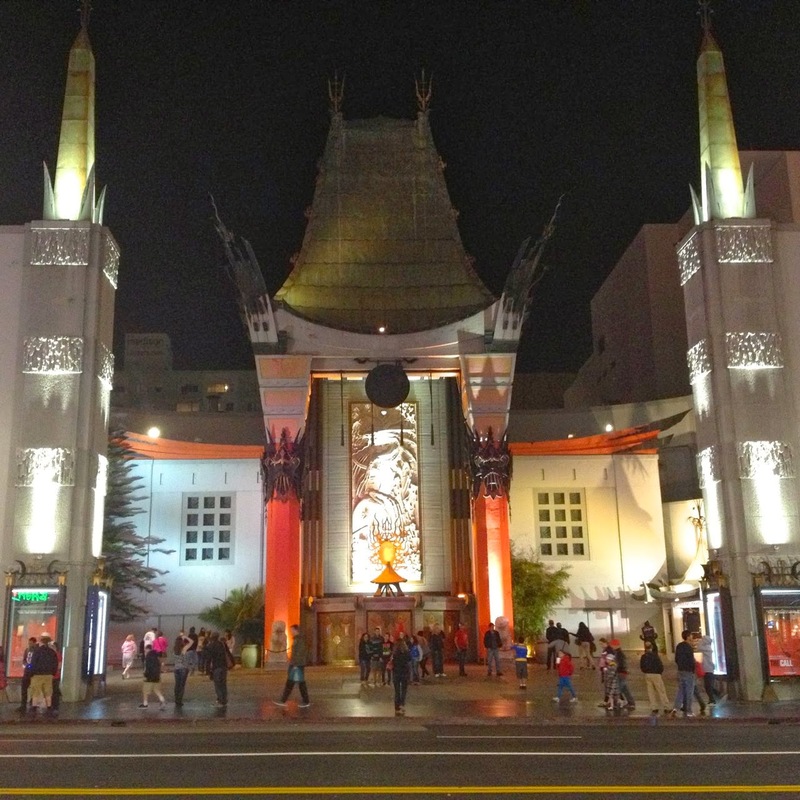 Here's a final view of the Chinese Theater was we walked home at night. 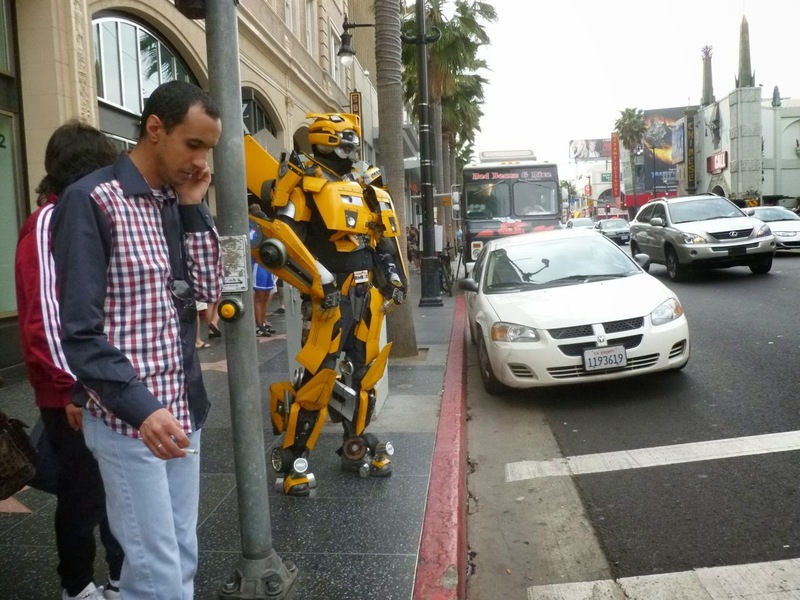 Our hotel was only three blocks off of Hollywood Blvd, so we decided to keep our car at the hotel and just walk. 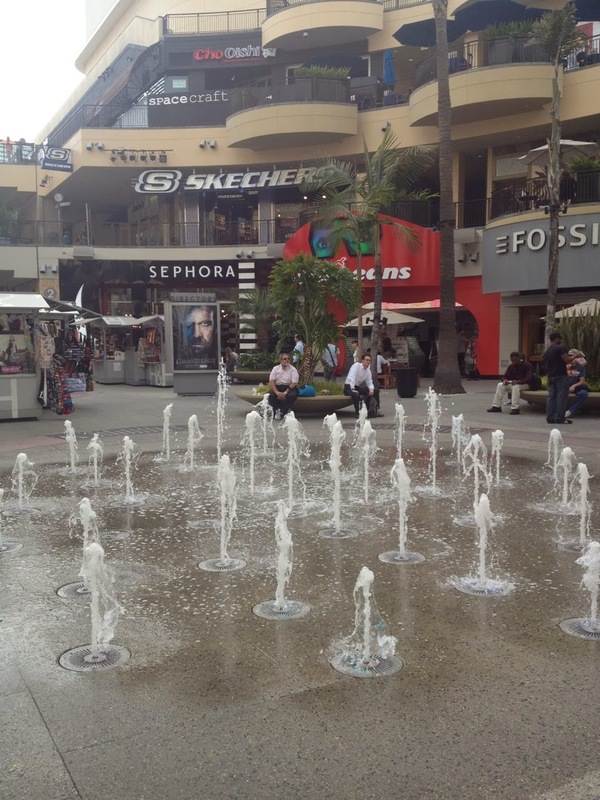 If you're driving, you can park across the street from the El Capitan at Hollywood and Highland (entrance off Highland). Our second day of our little vacation, which I'll cover in the next post, we purposely left our car at the hotel in Hollywood and explored L.A. via public transpiration: subway, bus, and light rail. It included a tour of downtown Los Angeles and and a chance to see Space Shuttle Endeavor at the California Science Center. More on that next time.